Light pollution is something that we are all increasingly aware of and which councils are doing their best to minimise. Lighting pedestrian and cycle pathways can cause something of a dilemma. Having lighting throughout the hours of darkness when perhaps very few people are around creates light pollution. On the other hand, turning lighting off at a predetermined hour is also not ideal especially for anyone needing to walk or cycle late at night or very early in the morning. It is a particular problem for shift workers leaving and going to work. Solisposts provide the perfect answer. 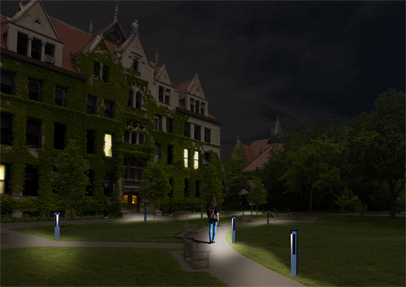 By providing a low level of continuous lighting, light pollution is kept to a minimum but when a person or cyclist approaches, the solispost illumination level is automatically increased as they pass by keeping them in a safe and reassuring pool of light at all times.